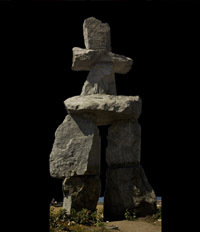 Inukshuk, like the one pictured below, are erected on the shoreline by Inuits and other peoples of the North. They serve as navigational aids as well as symbols of welcome for seafarers. On the shores of Vancouver's Stanley Park you'll find "Inukshuk" built by artists and amateurs as expressions of things that defy both gravity and words. These illustrations depict their "balance of life." Click here to view the full Inuktuk Collection catalog. Click here for a trifold brochure of a partial Inuktuk Collection.